The lottery for the 2019 Chicago Marathon took place yesterday. While a good portion of the runners were accepted, there were a lot of runners who were left out and will have to choose another fall marathon. Being a non-runner for 30 years I understand that it sounds crazy that there are so many people who want to endure 18+ weeks of training towards a grueling 26.2 mile race. So many people in fact that the race actually have to turn people away to keep it more manageable (somehow 45,000 people is manageable). But luckily, the end of the road is not here for these runners who did not get into thru the lottery. Runners have the ability to get an entry through one of many charities that are given bibs from the Chicago Marathon. The 2019 Chicago Marathon will be the 5th year I will be running for a charity – Ronald McDonald House. There is a minimum fundraising goal of $1750 for each of the charities now. When they opened charity registration earlier this year, the minimum was only $1500, but after the lottery was completed it they increased it. From what I understand those amounts are set by the Chicago Marathon and not by the individual charities. Although it does sound like a lot of money to fundraise, it actually has been pretty easy to meet the minimum each year because I have found people like to help other families. There are definitely some perks into fundraising for the Ronald McDonald House. Because you have chosen to fundraise for the Ronald McDonald House, they pick up the tab on the registration. That’s right, you don’t have to front the $195 race registration fee ($220 for international runners). If you were willing to pay that in registration fees, you can instead put that towards your fundraising as a tax deductible donation! If you are a runner who signs up for a bunch of races, it is easy to accumulate a closet full of free running gear. From personal experience, a lot of them are not too memorable. 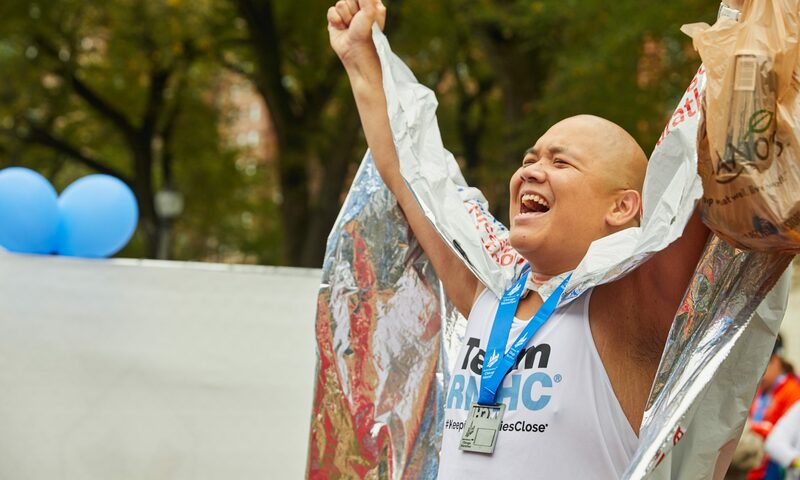 But having a shirt from Team RMHC shows other people that not only are you tough enough to train for a marathon, but also that you are compassionate enough to fundraise for families who need help while their child is in the hospital. About 1 in every 45 runners during last year’s race was fundraising for the Ronald McDonald House so you were able to find those shirts with the Team RMHC logo all along the course. You are not running alone! As an RMHC runner you have access to Coach Brendan who has created plans for various levels of runners – Beginners, Intermediate, Advanced, as well as Run/Walkers. If you ever have a question about training, you are able to ask him as he has trained tons of runners and run a ton or marathons. He recently completed the six marathons to be recognized as a Six Star World Major Marathon Finisher and has done over 100 marathons. He knows what his stuff. In addition you get a discount on CARA Marathon group training. You are able to choose between 11 sites in and around Chicago to meet up and do your long runs in a group setting. They also normally have pace groups of all different levels and speeds. Accountability is a big key to training and you get to meet some people who share a common crazy interest in running a marathon! I cannot stress how important these perks were for the marathon. Firstly, there are open blocks of hotel rooms downtown that are accessible to Team RMHC. They do fill up pretty quickly , so it is important to signup quickly when they do become available. Secondly, the pasta dinner the night before the race is quite fun. You are able to meet all of the other runners who are fundraising for the Ronald McDonald House and get to hear some stories of who you have helped. It is a great feeling seeing the people that have been impacted by your kindness. And lastly, and most importantly is the Team RMHC Hospitality tent. In the Team RMHC tent located right next to the corrals and the exit for finisher chute, you are able to come before the race and get some food and stay warm. Also, they have private gear check and restrooms so you don’t have to worry about the other 44,000 people trying to get a quick potty break or gear checked before and after the race. Family and friends are welcome into the tent after the start of the race (for a small fee) and after the race you are greeted with a glass of champagne and you walk into the tent on a red carpet. You have a ton of food that you can devour from cheeseburgers to cookies and everything in between. You can sign up for a free massage and they will stretch you out and work any tender areas (which is basically EVERYWHERE after a marathon). And you can sit on a chair. Normally you would have to sit on a curb or on the grass after the marathon. I can’t tell you how nice sitting on a chair is after running 26.2 miles. Seems like something small, but it really is the little things that make this experience. Running a marathon is hard. And honestly, training for it is even harder. There are days when I absolutely did not feel like running. But then I took a step back and remembered what it felt like when Justine was in the NICU. I went back to when we were staying at the Ronald McDonald House trying to figure out what we had to do for Justine to come home with us. I remember seeing other families at the house thinking the same thing. We were lucky. We got to take Justine home with us, but there are so many families who did not bring their child home. The Ronald McDonald House did not only give them a place to stay near their child. It gave them precious minutes, hours, and days with their child who would not make it out of the hospital. As hard as our time was in Justine’s early days, it is those families that move me. It is those families that I fight for mile after mile during training. So when I hit my fundraising goal and I cross that finish line, I do it for them. So where do you signup? Go to TEAM RMHC SIGNUP to register. You will gain access to a participant portal where you can setup your own fundraising page. This is My Fundraising Site if you wanted to see how one looks. You will also be allowed to join a Facebook group where you can chat with other Team RMHC runners about training and fundraising to help you throughout the year. Plus they sometimes some contests for the runners to keep you motivated and to have fun. Hope to see you at the start line with your RMHC gear! Earlier this week, Justine was on her mat in the basement playing with her favorite toys – markers. We have this box of markers that she just tears into when she gets a chance, grabbing handfuls and tossing them aside and then grabbing more. I love it when she picks up a new skill and runs with it. This past year she started sitting on her own, and now she can sit on her own and interact with things that are around her. It is easy to see the gross and fine motor gains, but I often wonder where she is emotionally and psychologically. There is no easy way to measure how mature she is at this point, especially since she is non-verbal. I have pushed aside my dreams of hearing her say “I love you, daddy” for now. If we can get her to say a single word with some regularity, I would be ecstatic. What I truly want is for her to understand who we are. Because she cannot call me “dad”, I sometimes struggle with the thought that she doesn’t know who I am. And if she doesn’t know who I am, does she miss me when I am gone? I honestly do not know. The usual thing people say to me is “Of course she misses you, Joey! You are her daddy!” And while that is a very nice thing to say to me, I don’t know how I can believe it. Yes, I am her father (cue Darth Vader breathing), but without her actually saying, “I missed you, daddy” how can I really know? I know is a selfish thing to want to be missed by my daughter, but I think deep down we all want that as parents. We want our children to understand who we are and want us around as much as possible. Even with some of her limitations she is still able to get her point across. There are so many times throughout the day Jaz and I just say “What is she thinking about?” Justine will just be in her sitter or laying in bed, and then all of a sudden giggle to herself. Was she remembering that time I tickled her non-stop through most of the Moana soundtrack? Or was she remembering that time Jaz scared her and she literally screamed and jumped off the bed? At this age, kids are discovering they can interact more effectively with the world and can start communicating their feelings and what they see and hear. Parents with children who are non-verbal have to pay a little more attention to get the message. There have been times that Jaz and I go out on a date night and we leave Justine with friends and family and when we return, her attitude changes one way or another. The babysitter will either tell us she was good until we got home, or that she was excited when she heard our voices. So that proves to us that she does know who we are. In a world where actions speak louder than words, because there are NO words, it is quite a statement from her. As you know I am running for the Ronald McDonald House again next year during the Chicago Marathon so you can donate directly to my fundraising efforts by going to THIS LINK! This year I had high hopes for my marathon. In previous years, my goal was to finish the race. This year, I wanted to see what I was truly capable of and run the race I knew I could run. I read in a book that if you want to get better at something, go hire someone to help you reach your goal. It seemed like such a simple concept, so I went looking for a coach. I found Heather at McKirdy Trained and we were a perfect fit. Over the past 6 months she has squeezed every ounce of potential out of my running by giving me workouts I had never done before. I will go over our training in another post, but one of the biggest takeaways is that you do not run over 2 hours and 30 minutes for ANY long run during training for a marathon. For me, that is time enough for me to run a half marathon. That’s right, I did not go over 13.1 miles in any run during my training. Seems crazy, right? But is it crazy enough to work? The forecast going into race day was 60° with 10-15mph winds coming from the northeast. Also there was going to be scattered showers throughout the first 3-4 hours. Although I was a little concerned about the rain, the cooler weather excited me because my last three marathons were a little too warm for me! We ended up staying at the Sheraton Grand Chicago on Columbus. It ended up being about a mile walk to the RMHC charity tent where there was food, music, and most importantly fellow Team RMHC runners who were all running for such an important organization. I ended up biking to the tent in the morning because I wanted to stay off my feet as much as possible before the race. But what I did not take into consideration was that I had never biked in downtown Chicago, with 40,000 pedestrians walking around at 6 in the morning. It was a little stressful! And to add to that, it had rained pretty good the night before so all of the streets were wet, meaning now my shoes and socks were wet even before I started the race! Not ideal! Luckily there were some heaters in the tent to help warm me up. I arrived at corral H around 7:30am. I tied plastic bags around my feet to try to keep them dry as long as possible. I love being in this corral because I get to see runners just like me who felt compelled to raise money for a charity and used the marathon as the vehicle to help them. I found a curb to sit on right as I entered the corral because I did not want to be standing for almost an hour waiting to start the race. At around 8am, a little but of rain showed up and I quickly threw on my disposable poncho we bought online. I knew I wasn’t going to wear it the whole time, but I needed to stay dry at least while I was waiting for the beginning of the race. For the first 6 miles I made sure I did not get caught up in the excitement of the race. I stayed on the slow end of my pace range clocking in 12min/mi. Of course I cried while running past the Ronald McDonald House during the first mile, and the rain started to pick up a little more towards mile 5. I wore my Nike Flyknit Epic Reacts for the beginning of the race, and they do not protect you from any kind of moisture. Since rain was in the forecast I had already planned for my wife’s cousins to meet me at the halfway point to swap out shoes. But in the meantime I was going to have slosh around in these shoes. The winds started to blow around while heading north. I knew Diana was planning to see me around mile 8 so I just had to get to her for my first checkpoint. I had told her I would be there maybe around 10am. During miles 7-9 I wanted to stretch the legs out a little bit, so I picked up the pace a bit. I ended up averaging under 11:30 for that 3 mile stretch and that included a quick stop to the port-a-potty. Turns out, I was a little faster than the 10am expectation I told Diana and I could not find her. It was the first time I had actually missed someone who I expected to be there. Although I was a little disappointed, I knew in the end it was up to me to do well in this race, whether or not I see my friends. Good thing I was able to become self-reliant because that ended up being a theme for the first half of the race. The next set of miles required a little more speed as there were surges at the beginning of every mile. I had done similar surges in training, and I liked them, so coach put them in my race plan. There was something to knowing that at the beginning of every mile I would pick up the pace. Oddly enough, I looked forward to those surges. I knew early into this segment of the race that I just needed to get to the halfway point. Ria and Erika would meet me to give me my change of shoes. My brother Tony and the Tumang family would also be there cheering me on. Getting back into the loop really is a big confidence and adrenaline boost. The crowds get louder again after tapering off a little bit, but the change of the course to run under the L was pretty awesome. I told Ria and Erika I was planning on being at the halfway point around 10:30 or so. But once again I underestimated myself and I was there a couple minutes before that time, and I missed them. I also missed the Tumang family around the same section. By some grace of God, my brother Tony who JUST stepped off the subway saw me and got my attention closer to mile 14. He was able to give me a fresh shirt and unlike any other marathon I had run, I changed and took off without much conversation. We only talked about how I missed everyone. I didn’t realize it at that point but I was only a couple minutes off of my PR for the half marathon distance during a race at 2:36:02 (PR – 2:34:56). Changing that shirt was huge for me. I felt like a brand new runner. The raining had pretty much stopped and was nowhere near what it was during the first 1/3 of the race. The winds were still a bit of a factor, it would occasionally gust and take my breathe away and I would have to cough it out. But my God, I was actually enjoying myself. As much as I love the Bulls, the mile and some change to the United Center has always been a breaking point for me. But with my race plan, it was much easier to chunk it into smaller pieces. My feet were starting to hurt after I had seen Tony so I popped in my AirPods and called Erick. I told him that I NEEDED those shoes. I know it must have been hard for him to hear me while I was running, but he got the message. Before the race I noticed a small whitehead that was on my stomach. I really did not think much of it, until about mile 15. Since I had my AirPods in I started to listen to some music to make the time go by a little quicker. Of course, I listened to the Hamilton soundtrack on Spotify. At some point I looked down at my feet to make sure they were pointing forward and not inward or outward and then I saw it. On my white Team RMHC singlet from last year was a deep red mark spreading down to my shorts. I honestly freaked out for a hot second. I was just jamming to “My Shot” and it looked like I had been shot. I quickly lifted up my shirt to find that whitehead had been chaffed raw and was not dripping blood. OK cool. That hasn’t happened before, but with all the rain, it was not a surprise. I went to the next Aid tent at Mile 15. I knew I was going to lose time, but I didn’t want this to get any worse. They patched me up and I lost about 3 1/2 minutes. I knew stops like that, and the stop to get new shoes would decrease my chances of hitting my goal time. I did not get to hung up on that. I knew I was doing well, and I would continue to do well, and maybe those stops will somehow reinvigorate me. I got to mile 17 with faded blood now on my singlet and there was my brother Tony, the Tumangs, and my sweet, sweet dry socks and shoes. I spent several minutes there, trying to change as fast as I could. I was ready to go pretty quickly, but then I forgot that I needed some aquaphor on my feet before I started off again. I had to take off the shoes and socks, apply the aquaphor, and then put everything back on again. I lost closer to 6 minutes on this interaction. Abby asked if I had wanted strawberries, and they sounded really good at the moment. But I did not want to break the “nothing new on race day” rule, so I sadly declined. This race was the fourth time they had seen me run a marathon, and all around the same spots. They had seen me at very difficult times in previous races, but here I was at mile 17, still looking good. For the first time they were saying I was going “too fast”. I gotta say, that really picked up my spirits. With my fresh shoes on I took off back on the course, and they said they would meet me again at around mile 21. It is around this time in the race that I tend to space out a bit. Not necessarily hitting a wall, but more just not being able to focus as much as I want. Although I now had dry shoes on, they are the ones I trained in all summer that had over 300 miles on them. They are the Hoka One One Bondi 5s which have a ton of support. But all I kept thinking about was that they had too many miles on them to race in. In comparison to the Reacts I was wearing during the first 17 miles, they were a lot bulkier. It is funny how your mind tries to create these roadblocks. What was I scared of? That the shoes were literally going to just break apart at the seams? I was going to finish this race even if I was still in the wet Nikes. Because of this internal argument, my pace slowed a bit over miles 18-20 to 12:13/mi. I arrived at mile 21 tired but still ready to finish the race. In previous marathons, this is where I looked my absolute worst,. Defeated. I remember one year I said I was going to quit. This year, I knew I was still in good shape to PR and that drove me, But, I still needed something more. My support crew was there ready with my last singlet change – the white Team RMHC singlet from this year. It was a little more snug than last years but was gleaming white from only being worn once in training. At least I could take the gun shot evidence singlet off now and I could look good in the remaining race photos! Abby again offered me strawberries. I was absolutely done with the gels I was taking. I knew I needed them, so that is why I took them, but I could not stomach one more of those. This time, I broke the law and had a strawberry. A sweet, sweet strawberry. It tasted SO good! I had the rest that was in her container. She then had some dried cranberries and wow it was like tasting sugar for the first time. It was what I needed. Another extra minutes logged at the stop, but this was what I needed. Erick said, “You are going to KILL YOUR PR”, and he was right. Even if I slowed down to 15min/mi, I would still PR by a ton. After that boost, I was ready to finish this race. Just like years past, they told me they would try to catch me at mile 25. But this year I had a plan of my own. It is interesting being in the latter half of the race finishers. You see all kinds of people going all kinds of paces. Some are just trying to survive the last few miles. Others are still moving pretty well, but you know they are mentally willing themselves to take each step. And finally there are people who are completely zoned in and determined to finish. I had been in the first two groups of runners at the end of the race. I always wished to be in that last group. And this year, I finally was able to put myself in that zoned-in group. It was a simple equation in the end: (1 mile + 1 minute surge) x 5 times = Chicago Marathon Finish Line. After the fruit goodies, I clocked a 11:57 on mile 23. I enjoyed that victory because I had never gotten anything near a 12min/mi at mile 23 of any other marathon. As long as I stayed around that pace and not longer than 13/min/mi, this would be easy. Mile 24: 12:52 – ugh, too close to 13 minutes, speed it up! Mile 25: 12:34, that’s more like it! I hear the familiar yell of “Go Joey” from my support crew. This time I do not stop. I simply stick my right hand out and don’t slow down. I hear my brother say “Oh! This is it? That’s it?” And then more cheering. There was only a handful of them there, but they meant so much to me in this race. I wanted them to know, that I got this. I FINALLY GOT THIS. That second to last turn onto Roosevelt is one of the most exciting turns in the race. There is still about a 1/2 mile left, but there is nothing but fatigue, adrenaline, and excitement fueling your legs. You earned every inch of pain you feel in that moment, but you know in a couple of minutes you are going to be incredibly happy. But first, you have to get over that damn bridge. The excitement fades away for a bit, and grit comes and takes over. I am literally clenching my jaw to get over the bridge and control my breathing as much as possible. I did not come this far to pass out just short of the finish line. Not only is the biggest incline of the race at the end of the race, but it also happens to be where the most race photographers are. That does not seem like coincidence. They want to see that pain in our faces and they definitely saw it in mine. The last left onto Columbus. I look at my watch, yeah I am going to destroy my PR. It was not the time I was hoping for, but I will absolutely take it. I feel like I am sprinting, but I realize that it is closer to a power walk than anything else, which is fine with me because I don’t want to run into anyone at the finish line. I raise my hands up in the air as I cross over the last timing mat. 5:36:24 – 63 minute PR! I sent a kiss up to Heaven to all the angels who were with me: my Dad, Tita Imelda, Uncle Rudy, Mason Vigan, Baby Gray, Tony Ocampo, and so many more who I thought of throughout training and throughout the race. Finally, I enjoyed a marathon! Finally, I smiled at the finish line! Finally, I did my best! Erika and Ria gave my shoes to the Tumangs! A few months back the running group I trained with decided they were going to send some teams to go run the Pettit Indoor Marathon Relay. I somehow got swept up in all of the excitement and put my name in as well. I was able to convince my old college friend Christine to join us also. If anything, it would give us a chance to catch up while we do the relay. Spots seemed to fill up quick and before we knew it, the BWRC was sending enough runners for 11 teams. Each team can have up to 4 runners and would collectively run the distance of a marathon on the indoor track – which ended up being 95 laps in total. If you have a full team of 4 runners it ended up being between 6-7mi per runner. The active runner ran with a velcro strap with the timing chip around their ankle. After their leg was done, we’d transfer the velcro strap to the next runner. Along with Christine, we were matched with Emily who is one of the site leaders for BWRC and Nolan who was a last minute replacement for someone else who couldn’t make it. From the very beginning we told each other we were not trying to hit any specific time or pace, so that took some of the pressure off. I brought my wireless Bose speaker and we had music the whole time so it was pretty clear we were in it to have some fun. The last time I ever did any kind of relay was when I was in high school. In the second or third to last event of the track meet, there would sometimes be a race called the “Weightman’s Relay”. It was a 4x100m race for shot-putters and discus-throwers. That’s right, it was the big guy relay. A lot of times this race was just an “exhibition” race – also known as “watch the fat guys run”. In all honesty I really enjoyed when I was able to run it, because just for 100m I could pretend I belonged out there on the track with the rest of the runners. I’ve known Christine for over 20 year now. Is that right? I can know people for that long? Man I am old! We were cheerleading stunt partners in college so our shared fitness goals started early on. After that we stayed friends and eventually started running around the same time. She even helped me finish my second marathon. I knew having her on the team would help me mentally just like it did when she ran in the marathon with me. Out of the four of us, Nolan was clearly the fastest. He is 11 years old and on cross country at his school. It was pretty amazing watching him run so fast and so effortlessly. I didn’t care about finishing fast, but with him on the team, he could cancel me out since I was the slowest. I haven’t known Emily very long, but one thing I do know is that she absolutely brings the positive energy. She is one of the site leaders and pace group leaders for BWRC and I was happy to find out she was on our team. I wish I was faster so I could run in her pace group too. The race started promptly at 1pm and we set the order of our runners – Christine, Nolan, Emily, then me. When Emily became our captain a few weeks back we decided to do 4-lap legs. After talking more on Facebook we decided to shave it down to 3 laps. We had no goal or strategy, so we just wanted to see how things would go. After each of us completed our first leg of 3 laps, we quickly changed our strategy to running 2 laps per leg. Since the track was a little longer than the standard track at 445m (.28mi) it messed with our pacing. We worried that we would get tired faster. “It’s a marathon, not a sprint” could not be more true at this point. We figured, if we knew we only had to do 2 laps at a time, it would be much easier to manage throughout the rest of the race. I had my Marathon Relay playlist rocking the entire time at our pit stop so we could pass the time waiting for our turn. Now with the shortened legs, there really was not that much time to wait around for your turn. One thing I did not consider was how quickly I would tighten up waiting my turn. The running track is secondary at the Pettit arena to the two hockey rinks and the olympic speed skating long track. The temperature felt like it was in the 50s the entire race. I would absolutely love this climate during an outdoor marathon, but not during an indoor marathon relay. One by one, the length of this race was starting to wear on us differently. First Nolan’s foot started hurting him and he was running out of energy. He was still clocking pretty quick splits, but you could tell he was not quite enjoying himself any longer. He ended up swapping his shoes out with some shoes he had broken in. Next my ankle started stiffening up and then eventually Christine started hurting also. Just like my marathon experiences in the past, we just had to keep chipping away at the miles. I refocused on the task- run 2 laps, rest for 6 laps, and repeat. At around mile 20, I caught a second wind, which was the opposite experience I have had running a marathon. I had three more legs to run, told Christine “I am feeling good, I am going to do these fast”. These last three legs were my fastest of the race. Christine was hurting bad by the end, so Emily and I picked up an extra lap to cover Christine’s last leg. That left Nolan to finish the last leg and the race for us. We wanted him to cross the finish line for our team, and the math of the of all the laps made that happen. We finished just under 4 hours, so now I can say I finished a marathon under 4 hours. I definitely underestimated what it would take to finish this relay. Normally, a 6.5-7mi run is something that seems absolutely doable, but when you pair that with constant cold temperature, and stopping and waiting a majority of the time, it gets a little more difficult. Next year I will be more mentally prepared for the race and hope that we will get a better time…as long as Nolan is back on my team.